Autumn Harvest 2014 is upon us, and as 60s chat and CrossEvents channels have shown, lots of people don’t know where to start. Have no fear though! Here’s a quick guide for you! Due to a variety of changes introduced in 2015, a new guide for Autumn Harvest 2015 is now up! Check it out here! Go to the Quest giver at Sanctum or Meridian. (will have pumpkins/hay around them). Pick up Pumpkin Quest. Go to Silverwood or Freemarch and collect 6x Pumpkins. Go to a Faerie Ring marked on the map with an Icon that looks like 2 Mushrooms. Click on the Soup in the middle to port to the Autumn Harvest instance. Pick up quests from Atrophinius and 3 other NPCs. One involves closing 5 Rifts of a certain element. Daily Quest. Gives 2 Signets (a currency for the world event). Other one is a Repeatable Daily Quest that gives a Lesser artifact potion and 10 Ambersaps (the other type of currency). This involves helping around the instance by killing Frost mobs and insect mobs, uprooting Roots or kicking shamblers into their den/cave. Rollo’s quest is a daily that involves collecting Autumncap Fungi from the open-world. Go near an Autumncap Fungus to get a Reactive. Use it to collect the Autumncap Fungi. Turning the quests in give you either Lesser, ‘Normal’ or Enhanced Potions of Autumn Eyes. The better the potion, the longer the effects last. Using them will allow you to see Artifacts hidden throughout the instance. There’s tons of Artifact nodes and they will give you a random artifact that covers both Pre-SL and SL artifacts. One word. Alts. Check stuff that is Bind on Account or Bind on Equip and do the quests on your Alts as well. Main ones are the items that require Signets. You can spawn an Autumn Harvest Rift called “An Auspicious Harvest” by using the lure of the same name. Obtainable from Cash Shop -> World Event -> Autumn Harvest for 5 Ambersap (default bottom of window). 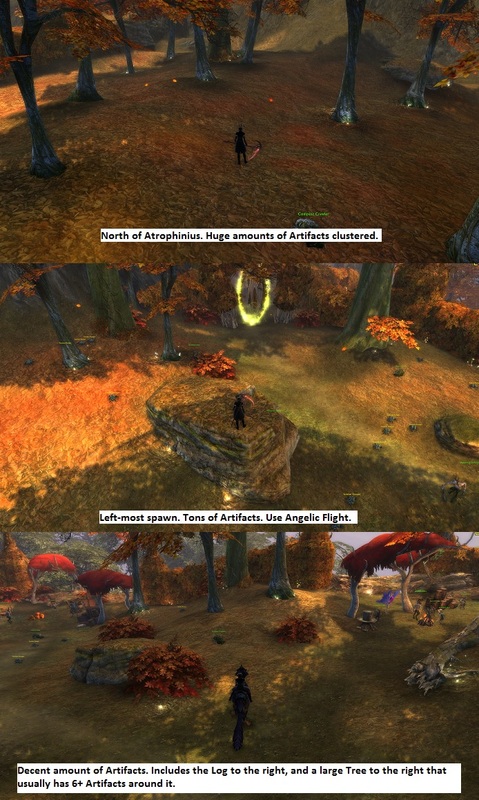 There are other Rifts that may pop up in the open world celebrating Autumn Harvest. Wearing all Jack o’ Lantern Masks gets you 10x Random Autumn Harvest Potions. Obtaining all Fae Puppets gets you Puppet: Twyl. Obtaining all Noble Puppets gets you Puppet: Salvarola. Wearing all Masks gets you the Armored Reaper Mount. Start off Autumn Harvest by going to either Sanctum (Guardian) or Meridian (Defiant) and speaking to a quest NPC surrounded by pumpkins and hay. Then travel to either Silverwood or Freemarch and collect 6x Pumpkins! You’ll be able to see the quest indicator icon on the map to see where the pumpkins are. Once there, collect 6x Pumpkins. They should respawn fairly fast – but if there are a ton of people there, try some of the other locations on the map. Find a Faerie Ring that is shown as a Two Mushrooms Icon on your map. They appear in all Pre-SL Zones. They will despawn and respawn in a random spawn location every now and then so don’t panick if you see one disappear. Click on the Soup in the middle to be teleported to The Realm of the Autumn Harvest, a special instance for the Autumn Harvest World Event! 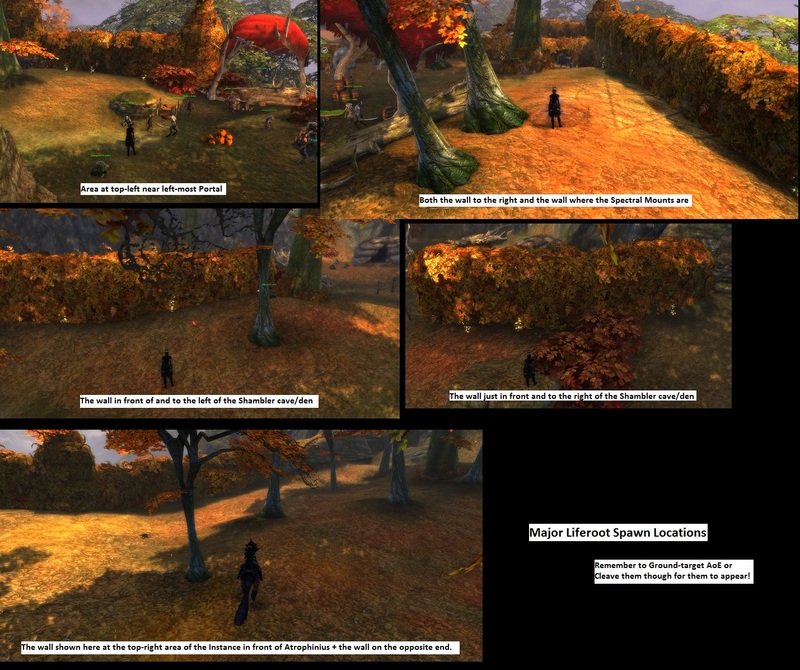 The Realm of the Autumn Harvest is a special instance for the World Event that you can enter whenever you click on the Soup in the middle of a Faerie Ring found in all pre-SL zones. First up, you can complete your Pumpkin Quest and return to your quest NPC in Sanctum/Meridian by clicking on the Quest item in the corner of your now updated Quest and throwing them onto a pile of Pumpkins located before most of the NPC quest givers in the instance. Atrophinius is located in the right-most area of the instance. He gives two quests: 5xRifts and Hand of the Harvest. This quest involves closing 5 Rifts that will grant you experience (in other words, where the mobs aren’t Gray to you). It rewards 2 Signets used to purchase certain Autumn Harvest items. This is a Daily Quest. The element of the Rift that you are required to close is random on a daily basis. This quest involves helping out Atrophinius’ buddies in the instance. There’s 4 ways of helping Atrophinius and I’ll list them by fastest to slowest method of completing the quest. This quest is a Repeatable Daily Quest so you can do once a day. It rewards you with 10 Ambersaps and a Lesser Potion of Autumn Eyes. This is the fastest method IF you manage to catch them as they spawn. These are basically beetles that spawn in swarms of 20+ in a tight bunch at either the left-most end of the map, or the right-top most end of the map. You can AoE them and it’ll quickly complete the quest for you. It can also be pretty fast if either not many people are killing them, or, you are in a large raid group (since you share quest progression). Note that once they leave their spawn area, they’ll quickly ‘split up’ and be harder to chain AoE unless you have a ground-targeted AoE channel ability like Circle of Oblivion (Cleric Inquisitor Soul) since they will follow a distinct path. This is the second-fastest method if you know where the spawns are. Basically most of the Hedges will have Liferoots around them. These Liferoots will only ‘appear’ when they are attacked – either by an NPC that will randomly engage them, or, by you using a Ground-targeted AoE ability at their location. Cleaves probably also work. 3 Frostjacks will appear near Atrophinius’ location and begin to channel a freezing spell on players and NPCs. If they finish their channel, that player/NPC becomes frozen for a small amount of time. If you help kill them, you’ll be rewarded with 5 points towards the quest objective once all 3 have died. You can tell when they respawn as Atrophinius will emote information about the Frostjacks spawning. I place this 3rd in terms of speed because the Frostjacks don’t respawn fast enough. This is by far the slowest method. You have to find a Compost Crawler (shambler), then use a Reactive you get to kick it all the way back to its Den/Cave. very slow, especially since you need to be pretty precise or you might overshoot the Den/Cave. Also, the Compost Crawlers like to move around even after you kick them; they can be kicked into the fence and log/etc and someone else can accidentally (or on purpose) kick the Compost Crawler away. Unless you hate yourself, don’t use this method. You might be wondering – What are all the bee hives for? Good question! They aren’t used for anything – just decoration. You see, the Realm of the Autumn Harvest instance is a copy of the Normal Dungeon version of Realm of the Fae. And in that Normal version of the Dungeon, it has those bee hives. Yep, that’s it. Doesn’t do anything. Rollo is a satyr in the instance that provides a daily quest based on collecting Autumncap Fungus (Fungi; plural) in the open world. You obtain Autumncap Fungus from the open world. All pre-SL zones have them and they are found on Trees and Rocks. A good place to farm is Gloamwood. Specifically – the town itself, the north-east forest area as well as the Silkweb Pass area to the south. Those areas have a ton of Autumncap Fungus spawns. Then, hit Save. Afterwards, drag your new Macro onto your hotkey bar and spam away. 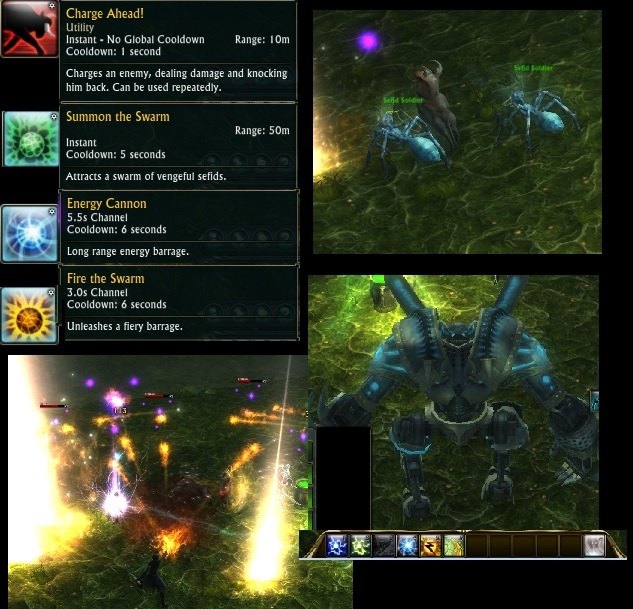 It’s advised to place the macro on a hotkey that you will find comfortable to spam whilst running around. I recommend collecting a good few Autumncaps before you go back into the instance so you cover multiple days’ worth of quests. Remember that a Faerie Ring will be on the map in every zone that’ll lead you back into the instance. Note that you’ll need to be near the Autumncap Fungus for the “cast Harvest Sickle” portion of the macro to work. However, this way, you just need to keep spamming the macro to locate the Autumncap Fungus, then run near the Fungus to pick it up rather than having to click on the Reactive when it pops up. Warning: Give yourself a break/rest every now and then. Your finger needs time-out too! Credit: Thanks to Nuerotic in the comments section for the heads-up on the “cast Harvest Sickle” macro! What are Potions of Autumn Eyes? Potions of Autumn Eyes comes in 3 flavors; Lesser, ‘Normal’ and Enhanced. The Potions basically allows you to see artifacts hidden in the instance. These can’t be seen by Omen Sight. There’s a large amount of ‘Artifact spawns’ that respawn at a relatively fast rate. They give you a random Artifact. Below are three areas that house a lot of Artifacts within short distance of each other to maximise your pots. Note that there are other areas that will benefit the lesser pots that have shorter buff durations. If you want to be really efficient and make the most of each of your potions, you should make use of your abilities. High Elf Racial Ability = Angelic Flight – This can help a ton with moving from large batch of artifact nodes to another in a more distant location. Run-speed buffs – Temporary runspeed buffs in souls like Inquisitor (Judicial Privilege x2) will help out a lot in getting from node to node. The Artifact Nodes are generally around rocks and trees – so any location with lots of thin trees will be worth going since the thin trees usually have 2-3 artifact nodes each and you can generally pick all 3 nodes up from a single location, minimizing downtime from movement. Mr Squeakles sells Dimension items, Sorel sells general stuff and Jeyriall sells food. Note that besides some of the items that Mr Squeakles sells, you can get everything else from the Cash Shop interface by going to RIFT Store -> World Event. It is in fact advised to go use the RIFT Store interface instead because Sorel doesn’t have a categorisation/filter system and can’t organise the Autumn Harvest items by class/item type/etc. So you realise you can’t get everything. Or can you? First up, Spectral Mounts are apparently Bind on Account. Or at least they are in the RIFT Store. You can get your alts to run the Autumn Harvest Signet-rewarding quests and then send the mount over to your main. The Masks (besides the Jack o’Lantern ones) are Bind on Equip. As such, you’ll probably see more and more of them on the AH as the days go by and by the end of the World Event, prices for each should be significantly lower than they are right now as more people sell off their ‘excess’ masks. As for the Jack o’Lantern Masks themselves? Bind on Account. Again, you can use alts to gain Signets and a tiny bit of Ambersap for this. The Random Discarded Puppet: Nobles and Fae Chests are Bind on Account as well. Again, you can use Alts. For your main you can get your Dimension Key for the Gloamwood Cottage or Harrow Crypt and farm Ambersaps for all the items that only cost ambersap. You can use a lure called “An Auspicious Harvest” that you can obtain from Cash Shop -> World Event -> Autumn Harvest for 5 Ambersaps (currency) to open a Rift called “An Auspicious Harvest” at any Tear in any zone in the open world (not including Raid Tears). The Rift has 5 Stages, each with its own special brew of Mead you can drink to gain an ability. The final phase gives you a random chance at abilities from the past as well as random chance to enter a Defiant mecha suit, or a Guardian suit. Final Phase is a fight against multiple fake christmas treants and their wispy minions! Overall reward is ~50 ambersap in total as well as a chance at an Autumn Harvest Bounty which gives you a random food item. There are also other rifts related to the Autumn Harvest including new ones such as the “Witch’s Brew” Rift. (where it looks as though the three witches are ‘relieving’ themselves in glorious neon colors). There’s some achievements related to Autumn Harvest that you can go after! Equip all Masks related to Autumn Harvest to get the Armored Reaper Mount! Note that besides the Jack o’Lantern Masks which are Bind on Account, all the other masks are Bind on Equip (unless you receive it from a Daily Patron Reward). This means you can trade/buy masks you are missing off the Auction House/other players! Collect all Fae Puppets obtainable from the “Random Discarded Puppet: Fae” chest to get Puppet: Twyl. Likewise, collect all Noble Puppets obtainable from the “Random Discarded Puppet: Noble” chest to get Puppet: Salvarola. Equip all the Jack o’Lantern Masks to complete “Jack of All Lanterns” and obtain 10x Random Autumn Harvest Potions (which provide 5min illusion/disguise potion consumables). You can obtain these items from Cash Shop -> World Event for either Autumn Harvest currency, or Credits. You obtain this by typing “/dance” into your chat window (minus the quotation marks) whilst in the special, temporary “Monster Mash: The Black Garden” warfront instance that is available throughout the duration of the Autumn Harvest World Event. To access this warfront, press K (default key) and choose “Monster Mash: The Black Garden” from the list of Warfronts available. Note: You have to be on the Defiant team during this special warfront and /dance to get this achieve. If you are a Guardian – either hope to get merced to the other side, or, queue up for the warfront with a Defiant friend and ask them to queue you in. This will increase the chance you get on the Defiant side. There’s two new achievements for Autumn Harvest 2014 found under Achievements -> World Events -> Autumn Harvest. You’ll need to complete all 6 Autumn Harvest Promotional Adventures. These can only be found by chance in the 10hr minion slot. You can access your Minions via default key “v“. Go Forth, My Minion! as mentioned previously, doing all 6 Autumn Harvest Promo (10hr) Adventures. Hope all this helps you make your way seamlessly through the Autumn Harvest World Event 2014! Want more info on the Items available to obtain in Autumn Harvest? Check out our list! Adding “cast Harvest Sickle” to the macro will cause it to target and harvest the fungi in one go. Works great if you have your loot set to auto. 2014 update – the potion repeatables are now once a day to stop artifact farming. Yep; quite a shame but I can understand where Trion is coming from.